Giant-Size Geek: Alan Davis: D.R. and Quinch vs Marvelman and Captain Britain! Alan Davis: D.R. and Quinch vs Marvelman and Captain Britain! What would happen if D.R. Quinch took on those other Alan Moore/Alan Davis creations, Marvelman and Captain Britain? The result wouldn’t be pretty. 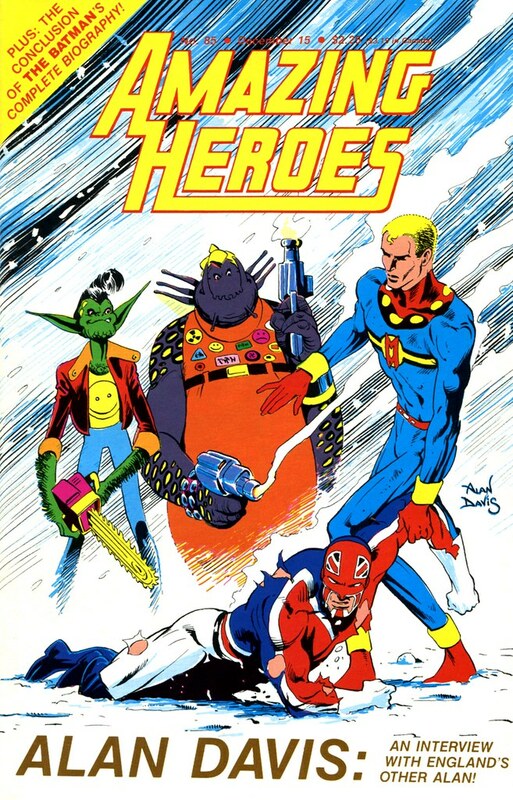 Those alien nerds would definitely win, as you can see from this amusing 1985 Amazing Heroes cover by Alan Davis. While the Marvelman and Captain Britain stories are well known, I suspect many fans haven’t read the D.R. and Quinch stories by Moore/Davis during 1983-85. The stories are very funny, weird, and slightly juvenile, in a good way. Nuff Said!